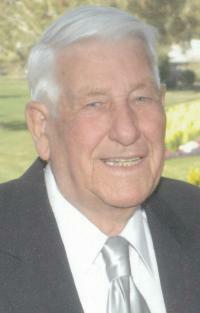 It is with great sadness that the family of Glen Barker announces his passing on June 3, 2013 at the age of 87. Glen leaves to mourn, his wife, Esther, celebrating 65 years of marriage; his daughter, Vicki (Jim) Duggan; his son, Glen “Tiger” Barker; grandchildren, Merrick and Carson Duggan; and his sister, Mildred Savory. He was predeceased by his brother-in-law, Harry Savory and by his close friend, Amigo. Glen had been an active year round sports enthusiast which inspired his family’s life style. He was a keen volunteer including over 20 years with the American Red Cross and their affiliations with abused children as well as several years with Sky Harbor Navigators. Glen served proudly in WWII on the HMCS Corvette Snowberry in the North Atlantic. He cherished his friendships and many good times shared at the family cottage at Pigeon Lake and in Mesa, Arizona. At Glen’s request, no formal service will be held. Cremation has taken place. Flowers are gratefully declined.